Ravensara aromatica is (also known as clove nutmeg) contains higher 1,8-Cineole content then other ravensara chemotypes with up to 30% Cineole content. Ravensara essential oil is a rare essential oil that is derived from the trees in Madagascar. While traditional medicine has not utilized Ravensara to its fullest potential many of the individual compounds contained within Ravensara are currently being researched for their various therapeutic benefits. The botanical species Be Young choses to supply is Ravensara aromatica which provide many of the properties Be Young specifically wanted to offer with this essential oil. Can be used in place of tea tree as a powerful alternative. 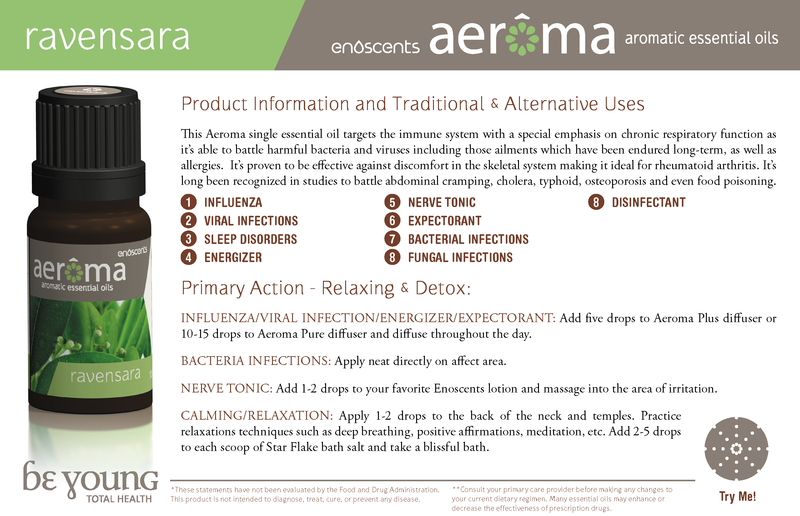 Alternative use has indicated the effects of Ravensara are several times stronger than Tea Tree essential oil. Making this oil, a much have in any essential oil collection to promote healthy immune system and rejuvenate the skin and body. Antioxidant: Based on the anti-oxidative and anti-inflammatory properties, recent clinical trials with 1,8-cineole have shown first evidence for the beneficial use of 1,8-cineole as long-term therapy in the prevention of COPD-exacerbations and to improve asthma control. (2).